Americans’ relationship with news is changing in dramatic and irreversible ways due to changes in the “ecology” of how news is available. Traditional news organizations are still very important to their consumers, but technology has scrambled every aspect of the relationship between news producers and the people who consume news. That change starts with the fact that those consumers now have the tools to be active participants in news creation, dissemination, and even the “editing” process. This report is aimed at describing the extent of the transformation and the ways in which news serves a variety of practical and civic needs in people’s lives. It focuses on those who receive and react to news and asks questions that are rarely asked about how people use the news in their lives, especially by exploiting the internet and cell phones. The report draws from a national phone survey of adults (those 18 and older) that documents how people’s use of new technologies has disrupted the traditional flow of news to consumers and in communities. The overarching narrative here is tied to technological change, generational differences, and the rise of a new kind of hybrid news consumer/participator. These shifts affect how people treat the news, relate to news organizations, and think of themselves as news makers and commentators in their own right. When asked about their routines for getting news on a typical day, and specifically which news platforms individuals turn to daily, the results are striking. Almost all American adults (99%) say that on a typical day, they get news from at least one news platform (local or national newspapers, local or national television news broadcasts, radio, or the internet), including 92% who follow the news on multiple platforms on a typical day. 17% read news in the print version national newspaper such as the New York Times or USA Today. In addition to exploring people’s use of these six platforms, we asked them about getting news on their cell phones. We found that 26% of Americans get their news from time to time on their handheld device. However, when we isolate the segment of people who access the internet via their phones, we find that 88% of this group gets news at least occasionally on their mobile device. Complete details about these mobile news consumers are contained in Part 5 of this report. It is also instructive to compare people who get news from a variety of sources on a given day with those who use only a few sources. Some 46% of Americans use between four and six of the media platforms cited in the bullets above on any given day. Another 46% use two or three platforms and 7% use just one platform. The notion that people have a primary news source, one place where they go for most of their news, in other words, is increasingly obsolete. Six in ten Americans (59%) get news from a combination of online and offline sources on a typical day, and the internet is now the third most popular news platform, behind local television news and national television news. While 61% of Americans get news online on a typical day, some 71% get news online at least occasionally and there is a detailed analysis of who they are, what they do, and what they like, in Part 4 of this report. While people access news on a medley of different platforms during the day, the story of their behavior on the internet is modest. As is the case with the general news ecology, most people do not express loyalty to one primary online news source, nor do they branch out to gather news from a wide array of websites. Most online news consumers (57%) say they use between two and five online news sources and 65% say they do not have a single favorite website for news. These findings are discussed in detail in Part 4 of the report on the internet and news. The number of media platforms a person uses turns out to be a strong indicator of people’s news-seeking behavior and attitudes about news and it will be used throughout this report as an analytical tool. For purposes of this introductory material, it is useful to note that those who use 4-6 platforms on any given day are 35% more likely than other Americans to say they follow the news all the time or almost all the time. Who uses multiple platforms? As would be expected, those with the highest educational attainment and annual household incomes are more likely than other adults to use multiple news platforms. Among college graduates, half (52%) get news from at least four news platforms on a typical day. Overall, single platform users tend to be younger, less educated, and have lower household incomes than adults who use multiple news platforms. An individual’s race/ethnicity is not related to the number of news platforms he or she uses on a regular basis. Among those who rely on just one news platform on a typical day, the internet and local television news are the most popular sources. Slightly more than one-third (36%) of single platform users get their news from the internet, while 29% of this group get their news exclusively from local television. Local TV news: This is the top source of news for Americans, so it is relatively popular across the board compared with other platforms. At the same time, some demographic groups are particularly likely to watch local TV news on a typical day when compared with other groups: women, African-Americans, and older Americans (those 65 and older). By comparison, those who are internet users and those who have a cell phone but no landline are less likely to get local TV news on a typical day than non-internet users and those who have a landline phone. Political Independents are significantly less likely to get local TV news than partisans in either party. Some 74% of Independents say they get news this way on a typical day compared with 81% of Democrats and 82% of Republicans. National broadcast and cable TV news: These are some of the demographic groups that are particularly likely to watch national broadcast and cable TV news on a typical day when compared with other adults: African-Americans, those over age 50, and those who have premium broadband plans that provide extra-fast connections. As is the case with local TV news, Independents are less likely than Republicans or Democrats to get news from a national TV newscast. Radio news: Looking at those who are most likely to listen to radio news either at home or in the car on a typical day, several demographic groups stand out: those between ages 30-64, college graduates, and those who use the internet and cell phones. Interestingly, those who are online are more likely to get radio news: 57% of internet users get radio news regularly, compared with 44% of non-users. Similarly, 53% of the cell-only population (those who have dropped their landline and rely exclusively on their cell phone) get radio news on a typical day, compared with 39% of those who rely exclusively on landlines. Radio news is also a major draw for Republicans and conservatives, compared with Democrats, moderates and liberals. Print version of local newspaper: Those who are particularly likely to read news in a printed version of their local paper on a typical day include: whites, those over age 50, and people who do not own cell phones. Paradoxically, non-internet users and those who have premium internet services are more likely than others to read local newspapers. Those who use text messaging and those who use social media sites like Facebook and Twitter are less likely to read the print version of local newspapers on a typical day than those who do not use those tech applications. Print version of a national newspaper like the New York Times or USA Today: The readers of the printed version of national newspapers are decidedly upscale. College graduates, those who live in households earning $75,000 or more, and internet users (especially those with premium plans) are more likely than others to read national newspapers on a typical day. Democrats are also disproportionately likely to get their news routinely from printed national newspapers. Americans may complain about the mix of news stories they get across the variety of platforms, but a majority still think that topic by topic there is sufficient coverage. 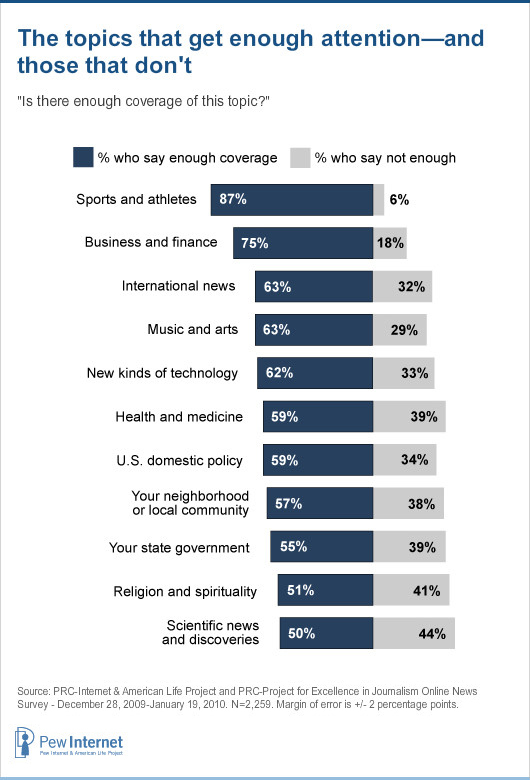 There is interesting variance across the topics, though, as significant majorities say there is enough coverage of such subjects as: sports and athletes; business and finance; music and the arts; international news; technology; U.S. domestic policy (see table below). Science news and discoveries: 44% of Americans say there is not enough coverage of science-related news. Younger adults are more likely than senior citizens to express interest in increased coverage. Some 52% of those ages 18-29 would like more coverage of this news, compared with 41% of 50-64 year-olds and 34% of those age 65 and older. Those who use the most news platforms (between four and six on a typical day) are among the most interested in getting more science news: 48% of them say so. Health and medicine: 39% of Americans say there is not enough coverage of health and medical news. African-Americans (50%) are more likely than whites (36%) to say there is not enough coverage; non-internet users (43%) are more likely than internet users (37%) to say this. Your state government: 39% of Americans say there is not enough coverage of news about their state government. There are no significant demographic variations where this topic is concerned. Your neighborhood or local community: 38% of Americans say there is not enough coverage of their neighborhood and local affairs. 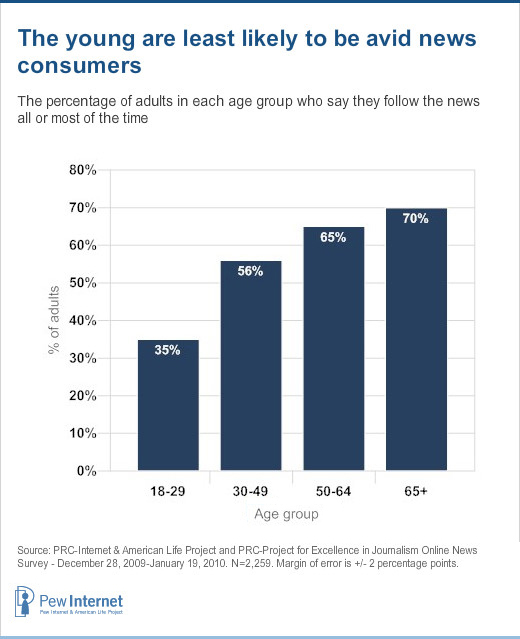 Young adults (41%) are more likely than senior citizens (31%) to believe this; those who get news on the internet (44%) are more likely than others (36%) to express this view. Independents are currently the largest political group in America today, representing 34% of U.S. adults. 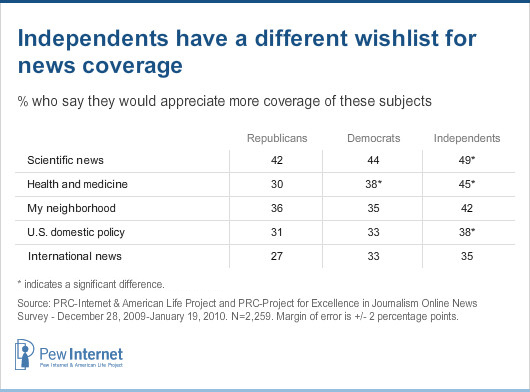 People who identify as Independents show their distinctiveness in several of these news categories. They are more likely than partisans of either the Democratic or Republican parties to say they want certain topics to get more attention from news organizations. Their distinctive wish list includes more coverage of science, health and medicine, their local communities, U.S. domestic policy, and international news.